the play in Nadiya is rolling in the dust. the play in Nadiya is only Harinama. the play in Nadiya is crying again and again! Born in southern California in 1951, Gadadhar pran das is a fallen sadhak of Sri Gauranga and Sri Krsna’s madhura lilas from a previous life. Becoming bewildered in his Western environment, he started searching. And after traveling in many countries, he reached India in 1969. While touring India’s ancient pilgrimage sites, Gadadhar pran discovered his lost course in Sri Vrndaban in 1972. Then Sri Gauranga Mahaprabhu’s call brought him to the Ganga’s shore at Sri Mayapura where he began Sri Sri Gadai-Gauranga Kunja project in 1980. Since then he has taken up a vrata to attain his eternal seva in Sri Navadvipa and Sri Vraja dhama. Gadadhar pran is a non-sectarian, free-lance bhakta who strives to duly honor all of SriGauranga Mahaprabhu’s followers. Srimati Vishnupriya’s deep, emotion-filled prema lila with Gauranga is endless, and it forms an intrinsic, inner part of his other pastimes. Hence it isn’t surprising that progressive vaisnavas wish to hold Vishnupriya and Gauranga centermost in their worship of Gaura lila. For as one hankers to know about Vishnupriya, one also gains insight into the mysteries of Gauranga’s ‘gupta Vrndabana’, which he keeps hidden in Nadiya. Because Vishnupriya and Gauranga’s madhura lilas run in parallel sequences with Radha and Krisna’s nikunja lilas, they are also diverse as the latter with infinite sakhi and dasi supporters. Virahini Vishnupriya’s incredibly painful plight in Gauranga’s separation is another important story. Because when Prabhu became a sannyasi, she took to performing even greater austerity and penences than he. Srimati’s viraha lila is heartrending, and penences than he. Srimati’s viraha lila is heartrending, and instructive for the vaisnavas because it teaches us the means for attaining Gauranga. It is a great misfortune therefore that her topic is only scarcely mentioned in the vaisnava sastras. Indeed, it is a cause for jubilation, however, that Mahatma Sishira Kumar Ghosh (1840-1911) wrote extensively about Vishnupriya in his six volume biography of Gauranga entitled Amiya Nimai carita. But Sishira wasn’t a bhakta for most of his life until something remarkable happened : One day while walking long the Churni river’s banks - he got Gauranga’s saksat darshan! This changed his life. He became “Gaurangamaya”, transported in Gauranga consciousness. Then came his inspiration to write Amiya Nimai carita. But before taking up his pen, he did a great deal of research and study. Murari Gupta’s Korcha, Govinda dasa’s Korcha, Kavikarnapura’s Caitanya Candrodaya, and Caitanya-carita maha-kavya, Probodhananda’s Caitanya candramrta, Vrndabana dasa’s Caitanya mangala, Ishana Nagara’s Advaita prakasa, and many other original sources including Mahajana padavali, all went into Amiya Nimai carita. Then to tie the ingredients into a story, Sishira used the divine realization (anubhava) that Gauranga imparted to him. The fruit is a stirring classic that awakens Gaura bhakti for its readers. Coincidentally, Sishira died in 1911, just a few moments after sending Amiya Nimai carita’s very last corrected proofs to the press. 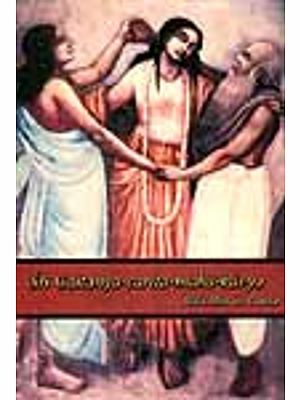 Although this book forms perhaps the most detailed and extensive account of Gauranga’s biography, the excerpts that we have translated from it may be the first to appear in the English language. Sishira Ghosh influenced a trend of Vishnupriya Gauranga worship that became popular in his time. 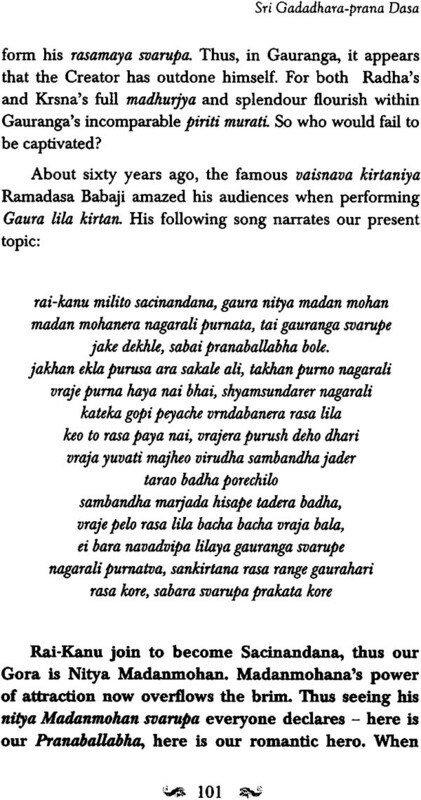 Then after demise, Sri Haridasa Goswami of Navadvipa (1867-1944) followed the genre. Haridasa dedicated his life to writing (in Bengali) about Srimati Vishnupriya devi. Some people even believe that Sishira entered Haridasa’s body to complete his writing task. Here are some of Haridasa’s major works. Sri Gauranga Mahabharata, Sri Vishnupriya carita, Sri Laksmipriya carita, Sri Vishnupriya nataka, Sri Vishnupriya vilapa giti, Gaura Vishnupriya’s Asta Kala lila, Vishnupriya mangala, Gambhira Vishnupirya and the Vishnupriya Gauranga Patrika, a monthly journal which followed after Sishira Ghosh’s Sri Vishnupriya Patrika. Apart from his being an authority on Vishnupriya, it would be challenging to find another so steeped in bhakti for her as Haridasa Goswami. The proof comes when sampling his literature. His heartrending passages which narrate Priyaji’s tragic episode with Gauranga invoke tears. But as he describes Priyaji’s joyful times, it won’t be surprising that ecstatic tears overtake the reader as well. How does he write so wonderfully? Is he actually seeing the lila, and witnessing it as Srimati’s nitya dasi? It won’t be surprising if many readers come to this conclusion. Because a great part of this essay follows Sishira Ghosh and Haridasa Goswami’s writing, I dedicate our Sri Sri Vishnupriya Gauranga Trilogy to them. My offering, of course, brings to mind the way mother Ganga is worshipped with her own water. As these two exhalted vaisnavas have laboured extensively to pioneer Vishnupriya and Gauranga’s worship in our modern period, surely many people will benefit from the path they have shown. Let us try and realize the deep purport of Sishira Ghosh’s statement as we read this essay. As Laksmipriya’s husband, Prabhu once went preaching in East Bengal, and met Tapan Mishra. Prabhu instructed Tapan to go to Varanasi, and gave the promise that he would soon meet him there. From this incident we learn that before Laksmi passed away, Prabhu knew that he would take sannyasa. So what was the necessity for him to marry Vishnupriya? Just consider, for a person desiring sannyasa, the greatest impediment for him is to have a beautiful, affectionate wife. When Laksmi passed away, this impediment was removed. So instead of taking sannyasa then, why did Prabhu go on to remarry ? For shortly thereafter, he cast innocent Vishnupriya, at the tender age of fourteen, into a fathomless ocean of lifelong grief! Surely, many persons may find fault with Gauranga for his apparently heartless act of abandoning Priyaji. Can it be said that he acted selfishly in accepting sannyasa as a newly-wed? yet if he had accepted sannyasa after Laksmipriya’s demise, this would not have stirred the attention that he desired. Hence, from his standpoint, his marriage with Vishnupriya was essential. Isn’t a man’s most coveted possession a beautiful, loving wife? And if she expires at a young age, the second wife becomes even more dear. So, to give up Priyaji was more painful for Gauranga than to remove his own heart. But that he did. And with this great display of renunciation Prabhu melted everyones’ heart; he even astonished those who opposed his mission! For when the news of his taking sannyasa spread like wildfire, all of Nadiya’s people became tearstruck! Why do people cry? Don’t we usually cry for selfish reasons : hen we lose a valuable possession, or especially, when we lose someone very dear” But when pondering the matter, isn’t Sri Bhagavan the closest and the most dear to us? Hence when Gauranga became lost to Nadiya’s residents, everyone began weeping? Yet amongst them, Vishnupriya was the most hurt, for she was the closest and the most dear to him. Now the question arises, why does Sri Bhagavan choose to hurt his dear ones-Priyaji, Mother Saci and his Nadiya bhakta community? Can we find any trace of cruelty in his renouncing them? But from Gauranga’s standpoint his motivation was selfless and magnanimous. He desired to soften everyone, to fill their hearts with sympathy and compassion. Because it is in this mood that prema bhakti becomes easy to distribute – through tears and embraces. 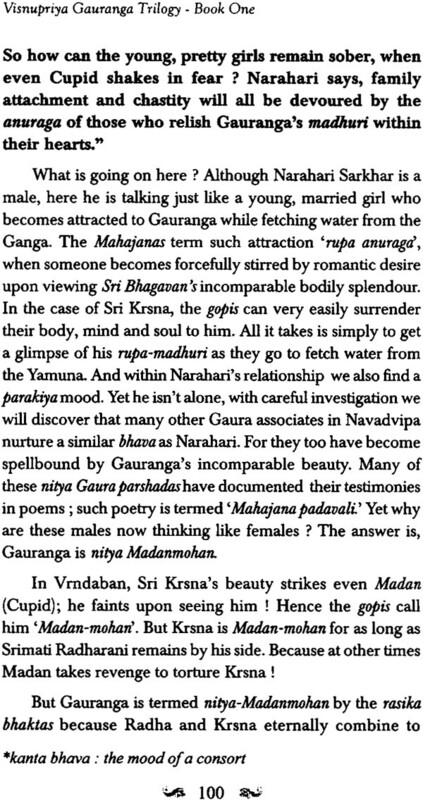 Sri Gauranga’s lifelong companionship in conjugal love. Such a painstaking vow, for a girl in new youth, is indeed an amazing feat. Although Priyaji suffered greatly the sorrow of Gauranga’s lifelong separation, she welcomed that sorrow as her constant companion. O readers, come. Let’s now enter Nadiya to witness the incredibly painful plight that Gauranga’s bhaktas experience in his separation. For in hearing about Vishnupriya’s, Saci’s and the bhaktas ‘trauma, our love for Gauranga will also awaken.